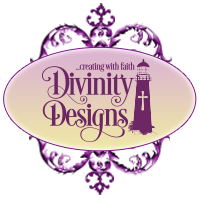 Divinity Designs, LLC Blog: Product Review, Technique Tips - Tri-Shutter Card! Product Review, Technique Tips - Tri-Shutter Card! Happy Monday, everyone!! If you have ever visited the Our Daily Bread designs booth at any craft shows, you have probably seen several gorgeous "Tri-Shutter Cards", created by some of our awesome Design Team gals, such as Chris Olsen, Connie McCotter, and Chrissy Dickinson. So many customers have asked, "How do you make one of these?" Today, I'll show you how easy and fun it is to make one of these unique shaped cards! Step one: Cut your 12 x 12 piece of cardstock to 12 x 5-1/2. 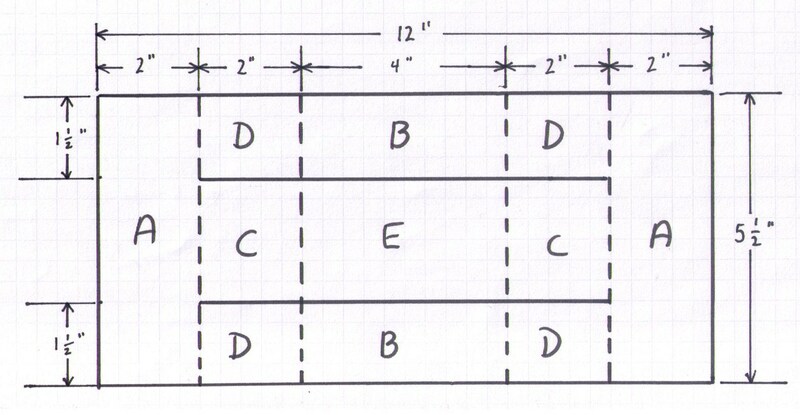 Place the 12" side horizontally on the scoring board. Step two: Using your Scor-pal or scoring tool, score as shown at 2", 4", 8", and 10". Step three: Turn the cardstock vertically. Using a craft knife and ruler (or paper cutter), measure 1-1/2" from the edge, and make a vertical cut from the 2" score line to the 10" score line. Do this on both sides. This photo shows what your cardstock should look like after being scored and cut. Please forgive this photo....the end section at the bottom of this photo is not shown (photographer error! ), but the next photo is complete! Step four: Fold the scored sections as you see in this photo. For a more sturdy card, do not fold the "T" on either end. Some crafters have traced the "T" shape onto designer paper and trimmed it down for a solid mat, but you can also decorate each panel separately, as I have done below. Here is a diagram of the measurements used. The dotted lines are for scoring and the solid two lines across the middle are to be cut. 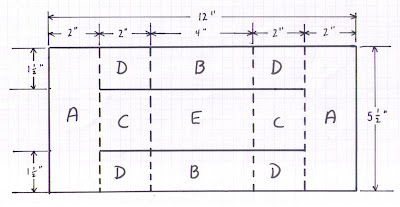 "E" panel measures 4 x 2-1/2, mat is 3-7/8 x 2-3/8, dsp is 3-3/4 x 2-1/4 Qty of 1 needed. For the top layer of my sample, I chose to use this gorgeous designer paper (or "dp") from the Prima "Reflections" line. Our Daily Bread designs carries a lovely variety of 6" x 6" paper pads by Prima and several other main-stream companies as well....check them out here. The strips were adhered to the vanilla mats, then the flower corners were matched up and adhered over those! Here are several views of the finished sample. I have used two different patterns from the Prima "Reflections" paper pack. The colors and designs in each pack coordinate beautifully with each other. The scripture verses are from two of the three new anniversary sets, Scripture Collection 6 and Scripture Collection 7; the scripted butterflies are from the "Faith" set....I just had to use the butterflies from this set since the butterflies on the designer paper were "scripted" also...how cool! This is what the card looks like closed....sort of....once again, oops, not a great photo!! The closed card measures 5-1/2 x 4, but would not be likely to fit very well in an A2 sized envelope because of the thickness of the layers. I hope you enjoyed the tutorial! If I skipped any steps or instructions, feel free to email me at angelladcrockett at yahoo dot com. Definitely give this technique a try.....it is much more simple than it appears.....the hard part for me was figuring out how to decorate it!! Thanks for visiting with us today! Stay tuned tomorrow for the final week of our monthly Let Your Light Shine Challenge! Gorgeous Tri Shutter Angela and I love to make those, they are so elegant and not that hard to make. thanks for the tutorial!! Fabulous Ang!! Yup, we had several ask this past weekend!! This is so beautiful. Thanks for the tutorial. I hope I get the chance to make one soon. Have a great day. Stunning Tri Shutter Ang!! Gorgeous design and demo!! This is fabulous- I love these shutter cards. This looks like a terrific tutorial, I'm not as scared to try it now, thanks! Beautiful card. I agree the construction is the easy part, the decoration is indeed the hard part. I love how easy you made that part. Maybe you could do another tutorial on the never ending flip flop card. Fairly easy to construct but quite a challenge to decorate. Thanks for putting the scriptures as the focal. This is an awesome tutorial. I'm leaving you know to go to my stamp cave and try this! Thanks! Oh Angie.... this is beyond gorgeous!!! The trishutter really packes a punch of wow factor! GREAT tutorial!!! I love tri-shutter cards and love to make them. This is a beauty. Still looking for for what the blog post title mentioned... especially the sale. I didn't see any mention of it in the post. Oh my that is just gorgeous, and thanks for sharing how it is done! I love sbobet tri-shutter cards and love to make them. This is a beauty. Still looking for for what the blog post title mentioned... especially the sale. I didn't see sbo any mention of it in the post. Thank you for the detailed how to! Also, thank you for sharing God's words. Sometimes those are just the verses one needs! Moltes gràcies per mostrar-nos aquesta forma tan preciosa de fer una targeta! Thank you for teach us how to do it!